After an incredible return to the front end of the grid, Williams hope to consolidate their recent upturn by fighting for more podiums and potentially victories in 2015. Heavy investment (that ultimately put them in debt) last year has indeed paid off as a host of new sponsors join the Martini-striped FW37, a car that looks like a good progression of last year’s concept. After the first test in Jerez, Williams were joint top of the speed traps (along with Mercedes) despite running on lower power. 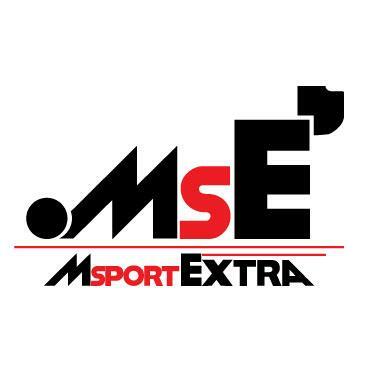 A recent interview with Pat Symonds revealed that the team have aimed to retain its low-drag characteristics from last year whilst making a good step forward in downforce and early indications suggest this is exactly what they have done. The nose is one of the more elegant solutions this year and it really pushes the envelope in terms of passing crash tests whilst maintaining a good aerodynamic shape. The black paint attempts to trick the eye as to how they are shaping the nose, particularly the underside and how the stub forms into the main body of the crash structure. However I believe that this is what they are achieving with the two required cross sectional areas. The stub obviously forms the 9,000mm2 frontal area, just behind the mesh-grilled nose tip and hanging as far back as possible within the regulations. Further back the stub curves upwards into the main section of the nose, creating a wide 20,000mm2 T-shaped area. The rest of the nose behind has a flat bottom that provides a smooth surface for airflow to travel down the car. As a result the nose is left with a nice arch eitherside of the stub with a lot of volume for air to pass into. It is arguably the best solution for getting as much air beneath the nose as possible, for only Red Bull have a wider arched region at a compromise for a lower tip height. This shorter layout is much harder to pass the crash tests with as the crumple zone is shorter. More material must be added as a compromise (in the region of a few kilograms of additional layers of carbon fibre) but Symonds has also stated that from the simulations they have run, short is definitely the way forward. Camera pods have simply been placed ahead of a gap between the lower wishbone and steering arm for good aero management but these could change as a loophole in the regulations still allows the ‘handlebar’/’horn’ shaped design. Like last year Williams are using the nose pylons as a good way of manipulating flow ahead of the splitter, creating a stepped twisted profile to work with the Y250 vortex immediately next to it. These pylons connect to the main plane of the front wing as far back as possible, allowing the central section to work the air harder than a long nose would. The wing itself remains so far unchanged from 2014 although that will almost certainly change over the coming test sessions. However a little reprofiling has been done around the endplates to push air further outwards around the front tyre. The front suspension is virtually the same as last year, although a return to the pre-2014 brake ducts (like Mercedes) has seen the removal of the main inlet duct in favour of a small opening between the duct’s guide plane and the front tyre. This will reduce drag substantially and aid front tyre wake management considerably. Further back and it’s the sidepods that have received a deceptively large amount of work on the FW37. Their profile overall is much narrower and the intakes are smaller, emphasised by the longer attaching stalks on the vertical turning vanes that lie off the shoulder of the ‘pod. The undercut is also deeper and extends all the way round to the back of the car, picking up airflow off the bargeboard and sending it to the top of the diffuser for more efficient downforce. 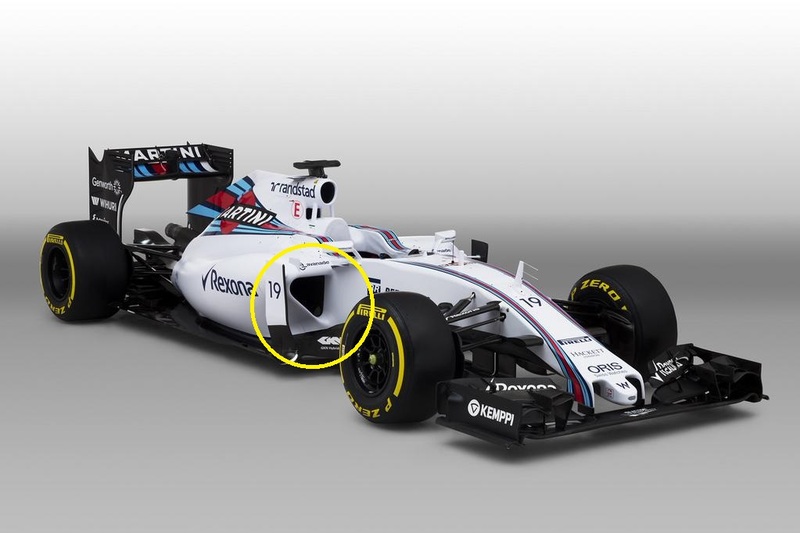 On top of the sidepod lies a single vortex generator which helps disperse stagnant air and send it rearward. This has been coupled to the unchanged wing mirrors and curved flow conditioning devices on the cockpit side. The Coke-bottle region at the rear has been pinched further inwards to cut drag and expose the top of the diffuser to even more air. This generates a stronger pressure gradient between the two sides of the floor as well as work the aero devices that lie along the central section beneath the rear crash structure much harder. Combined with their trademark low-lying gearbox, the FW37 is packaged incredibly well at the rear end. Despite the early render impressions, cooling outlets are still visible on the roll hoop and the cockpit side. As the sidepods have been made smaller, the inlet beneath the airbox has been increased in size slightly to provide further cooling to the electronics systems although this could easily feed the Mercedes power unit, too. It is unclear whether Williams have adopted the same setup as last year’s Mercedes by placing a water-jacket intercooler vertically behind the chassis’ rear bulkhead or whether they have kept an air-to-air cooler in the sidepod. Above the rollhoop is a modified vane from last year to condition airflow ahead of the rear wing. 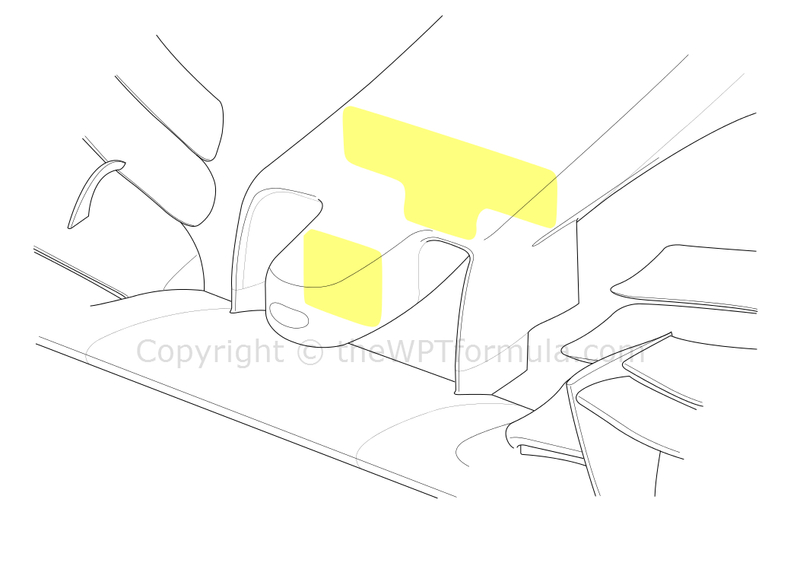 It appears to take some design ideas from the Mercedes ground speed sensor ‘bat wing’, by partially splitting the vane at the inboard section to further energise the trailing wake. At the moment the rear of the FW37 appears to be little different to last year – which is true. The diffuser is currently still the same specification that they ended 2014 with and the rear wing also remains attached to the floor rather than using a central pylon like most other teams. This is heavier but there is much less overall blockage which cuts drag. 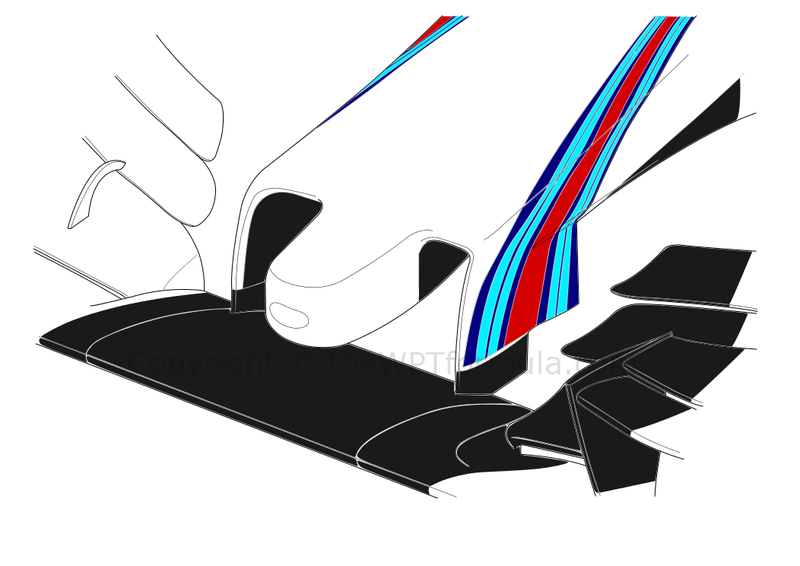 Williams can also exploit laying up the carbon fibre in the endplates in such a way that at high speed the wing will oscillate to stall the airflow, again decreasing drag and increasing top speed. However the rear suspension has been completely redesigned. The pullrod now passes in between the lower wishbone arms, compacting the area needed the place the rear dampers but leaving more room to juggle the power unit’s components. The revisions made to the geometry will be aimed at improving mechanical grip, particularly at high speed – an area in which Williams never quite had a good handle on. Ahead of the rear tyre two slots have been added to offset tyre squirt from the diffuser, accompanied by two strakes to vorticise the area for better rear downforce. Finally, Williams – like all the other teams in F1 now – have installed the PCU-8D dashboard display from McLaren. However the display is not fitted to the steering wheel, instead fixing to the cockpit ahead of the steering wheel. This is actually quite cost effective as there has been no need for a total redesign of the wheel, which can be tricky and time consuming. As a result the butterfly-shaped wheel from last year has been carried over. At the moment the FW37 looks like a very solid car with the nose being a technical highlight. Red Bull are one of number of teams considering a switch to a similar design so it looks as if Williams could well have stolen a march on the competition. Barcelona testing will hopefully reveal a little more as to how Williams stack up against Mercedes and if they can indeed challenge for victories in 2015. 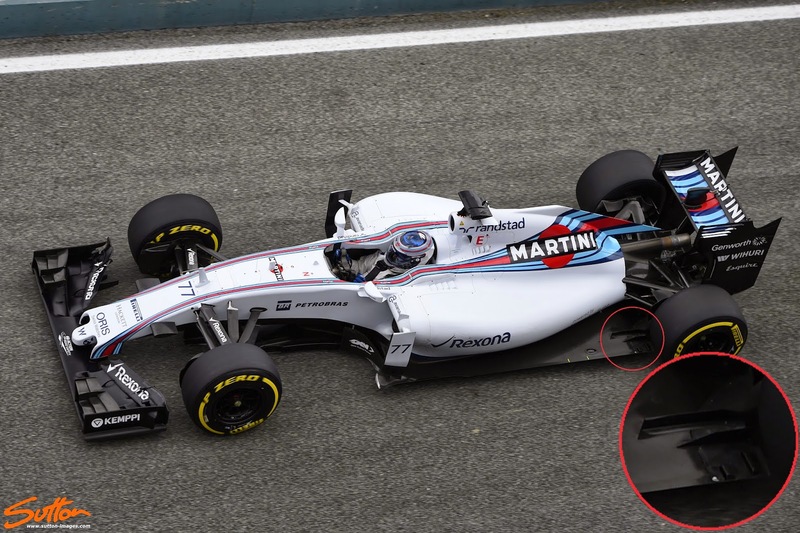 This entry was posted in 2015 Launches, Car Launches and tagged 2015, analysis, car, f1, fw37, martini, nose, stub, technical, williams on February 14, 2015 by thewptformula.